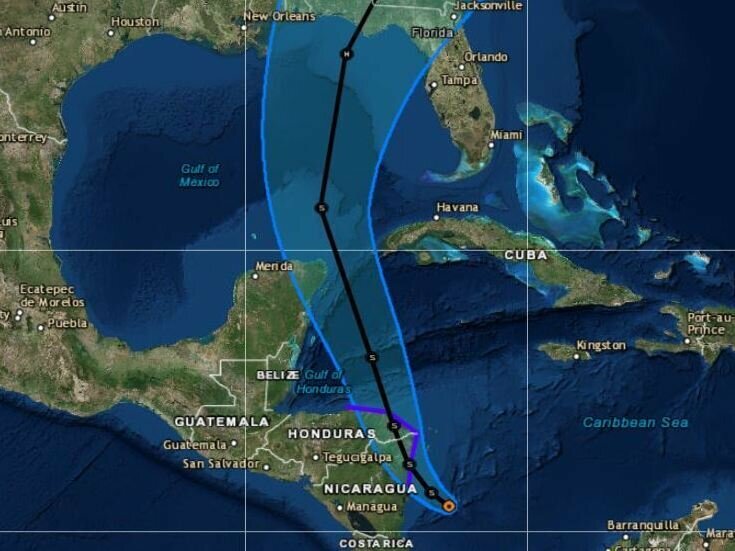 The current forecast track calls for the storm to thread its way between Cancún, Mexico, and the western coast of Cuba. A new tropical depression has formed in the southwestern Caribbean Sea — and it is expected to develop into a hurricane before possibly hitting the U.S. Gulf Coast late this weekend, the National Hurricane Center says. The NHC issued its first public advisory about the storm, which has been dubbed Tropical Depression 16, on Wednesday. If the system develops as expected, it would be dubbed Nate — first as a tropical storm and later, if warranted, as a hurricane — according to the list of 2017 tropical cyclone names. 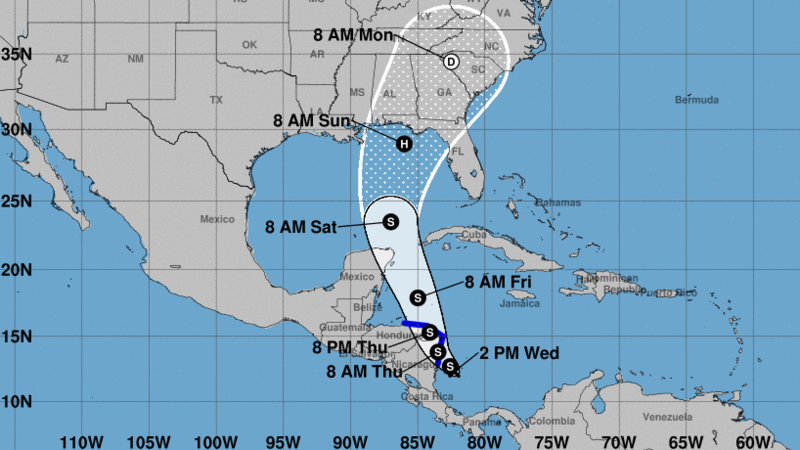 The federal hurricane center’s current forecast track calls for the tropical cyclone to thread its way between Cancún, Mexico, and the western coast of Cuba to enter the Gulf of Mexico. Once in the Gulf, it could strengthen into a hurricane shortly before arriving at the U.S. mainland, possibly by around 8 a.m. ET Sunday. The cyclone is expected to “bring tropical storm conditions and heavy rainfall to portions of Nicaragua and Honduras tonight through Thursday,” the NHC warns. Parts of Central America could see flash floods, mudslides and rain of up to 30 inches in some places. It’s too early to know the precise level of threat the storm might pose to others in its path. Right now, its maximum sustained winds are only measured at around 35 mph. But over the next four days, its sustained winds are expected to strengthen to at least 80 mph. Tropical Depression 16 is heading for the coasts of Nicaragua and Honduras — and it is predicted to become a hurricane after it reaches the Gulf of Mexico, the National Hurricane Center says. News of the developing cyclone comes after a series of hurricanes brought floodwaters and destruction, from Hurricane Harvey soaking Houston and nearby areas to Hurricane Irma blasting the Leeward Islands and Florida to Hurricane Maria hitting more islands before plowing through the center of Puerto Rico. As member station WLRN reports from Miami, some 4,000 “hurricane evacuees from Puerto Rico and the U.S. Virgin Islands” arrived in Florida this week.